Nancy Kissel will stand retrial in the death of her husband. Hong Kong, China (CNN) -- An American woman called the "milkshake murderer" after she was found guilty of killing her husband in a case that rocked Hong Kong's expatriate community had her conviction thrown out Thursday by Hong Kong's highest appeals court. The Court of Final Appeal said in its judgment there were "numerous elements of grave concern" when reviewing the case to decide if Nancy Kissel had received a "fair trial." "The Court unanimously allows the appeal, quashes the conviction and orders a retrial," the judgment said. "The Court further orders that the appellant be remanded in custody pending retrial." "It is plainly in the interests of justice that there should be a retrial," the judgment said. 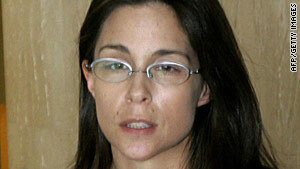 Kissel was found guilty in 2005 of the November 2, 2003, killing of her husband Robert Kissel in the southern Chinese city. She was sentenced to life in prison. The prosecution alleged that Robert was tricked by his wife into drinking what appeared to be a milkshake, but was in fact a cocktail of drugs. They said she later attacked him with a "heavy metal ornament" -- striking him in the head -- as he slept, the judgment said. It is plainly in the interests of justice that there should be a retrial. The body of Robert Kissel was found in the couple's storeroom four days after his death. His body was discovered "in a sleeping bag with towels inside a rolled-up carpet over which was placed plastic sheeting secured by rope and masking tape, with four cushions placed on top and held together by adhesive tape," according to the judgment. Nancy Kissel admitted killing her husband, but pleaded not guilty by way of self-defense and provocation. Her lawyers said she killed her husband after a violent argument in their home. A court of appeal rejected her appeal, which she then took to the higher court. In its judgment on Thursday, the Court of Final Appeal accepted two of three grounds of appeal put forward by Kissel's attorneys, including one concerning "hearsay evidence" from two witnesses who said that Robert had told them he suspected his wife of poisoning his whiskey and trying to kill him. "The Judge had ruled admissible copious evidence ... which was logically probative of the deceased's perception of the state of the marriage and which would amply enable the jury to assess the contrasting ways in which each side was depicting the couple's relationship in the months preceding his death," the judgment said. "There was no need for them to receive the highly prejudicial evidence of suspected poisoning for that purpose." "The appellant (Nancy Kissel) has therefore succeeded in showing that a material error was made in the admission of such evidence at her trial," it added. Calls placed to two of Nancy Kissel's lawyers seeking comment were not immediately returned. Another one, Alexander S. King SC, declined to comment, saying it would be inappropriate at this stage since he is representing her as a trial lawyer. The couple married in 1989 and moved to Hong Kong in 1998, when Robert accepted a job with Goldman Sachs. They had three children together and Robert later moved to a position at Merrill Lynch. During the trial, Nancy Kissel alleged that the couple's relationship deteriorated in the five years prior to his death because he abused alcohol and cocaine and he became increasingly violent. The prosecution presented evidence claiming that Robert "had a pleasant character and personality and was a loving father," the judgment said. The trial made headlines in Hong Kong as details of the couple's relationship emerged. Who won estate of one of Asia's richest women?